Shortlisted for the APL Hard Landscaping Award 2019! 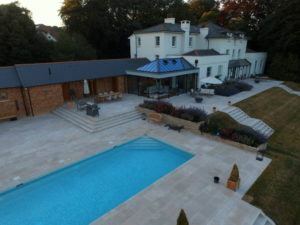 The Association of Professional Landscapers (APL) announced their shortlist for their 2019 awards and are excited to have one of our projects shortlisted in the hard landscaping category as sponsored by Bradstone. Each year since 1995 the APL have been recognising and rewarding the high standard of landscaping installations carried out by their members. The purpose of the awards is to promote their members commitment to quality landscaping installations and keeping their clients satisfied. We are extremely proud of the hard landscaping project that we have been shortlisted for – Tarrant Keyneston House. 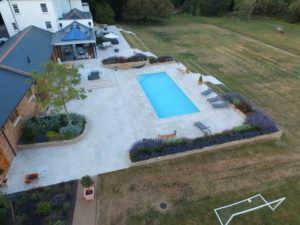 A large hard landscaping patio and garden project that wraps around the rear of the house and encompasses an outdoor dining area, pool and steps down to lawn. 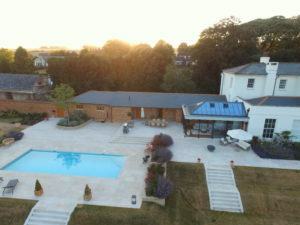 Laid in Cranbourne Stone’s Fossil Pearl it’s a stunning paving project. We look forward to the winners being announced in March 2019.